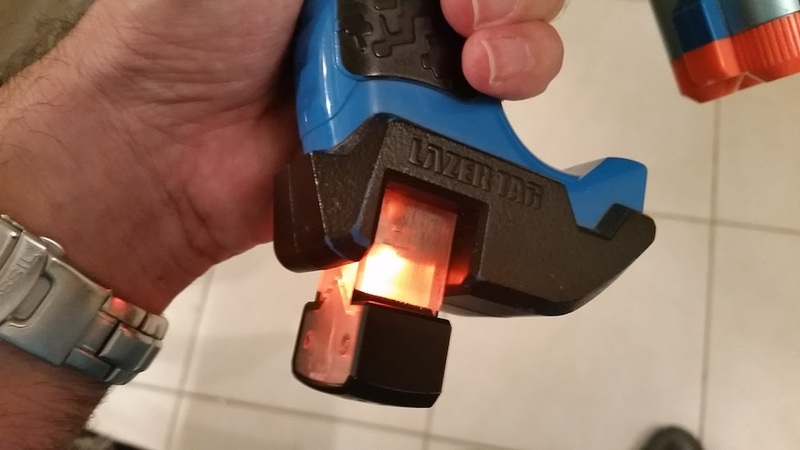 In April 2015 we ordered two sets of the Nerf Lazer Tag Phoenix LTX and spent hours playing with them within 15 minutes of opening the package. So to sum up this article in one sentence, this is the one gift that will be played with over and over again for years. The key to having fun with these guns is having the right people to play with and the right place to play. The truth is these are so fun that you could play almost anywhere with them. There are very few toys out there that can bring consistent fun. While they may not play with the toys everyday or even every week they will definitely go back to them from time to time. The guns have gotten so popular that most of the kids on our block have purchased them as well. We could see as many as 8-10 kids playing at one time and this is two years after we purchased the product. The truth is I dont really know how it works. My guess is that some sort of beam is shot out of the barrel of the gun and is detected by the round red piece on the top of the gun. Sorry but that is as technical as I could get. What you really need to know is that the gun itself needs to be shot and not the person holding the gun. So often while playing people will stand in full view of opposing players and they will keep their gun hidden behind a wall, car, or tree. The range is pretty amazing as well. You could easily hit a target more than 300 feet away. Depending on how good your aim is. 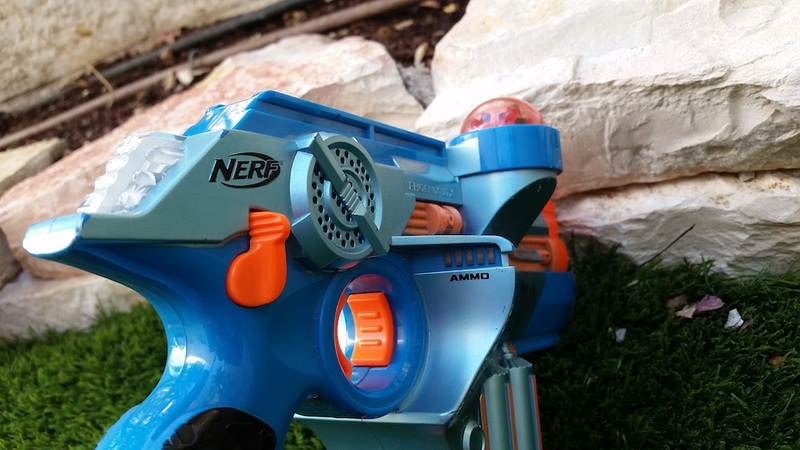 With these guns, you could play up to three team style games. The first is Solo mode where its basically every person for themselves. The next two are for Team 1 or Team 2. Some versions of this gun allow for 3 teams. But I dont see it necessary to have more than two teams. I did read somewhere that if you set the button between the two teams and press the trigger you can activate a third team. Never tried so I dont know if this works. Depending on how long you want the game to be, you can choose to have 10 lives or 25 lives. This means that your gun will need to be shot either 10 times or 25 times before being out of the game. 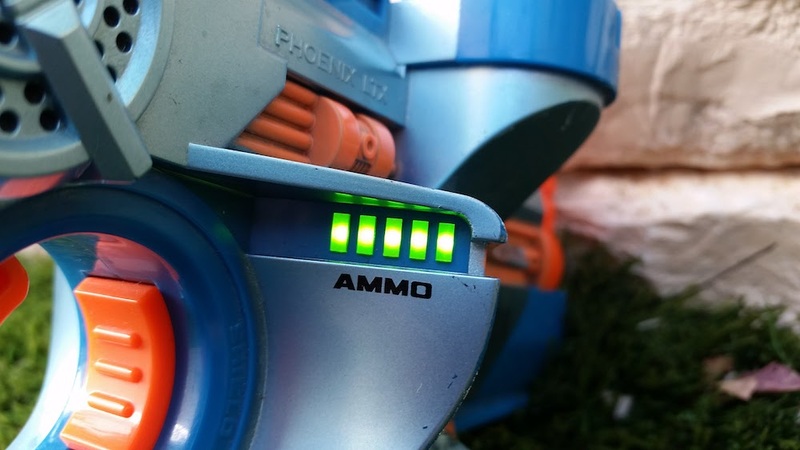 This setting allows you to change the range of the beam on the guns. In Outdoor mode, the range will be longer while indoors the range will be much shorter. This is a really awesome mode to have on these guns. While outdoor playing could be fun, playing indoors could be a whole different experience. Especially great for the winter or rainy days. More about ways to play indoors later on in this article. 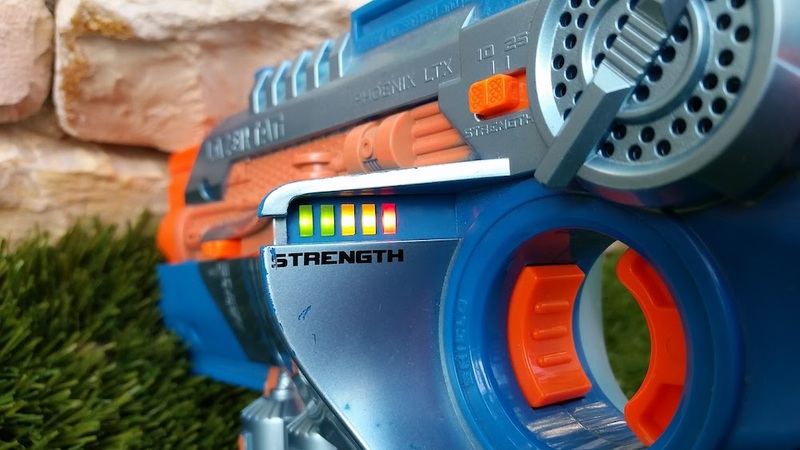 These guns have two indicators with one on each side. The first indicator is Strength. This displays how many lives you have left before you are out of the game. The more you get hit the more bars will disappear from the indicator. 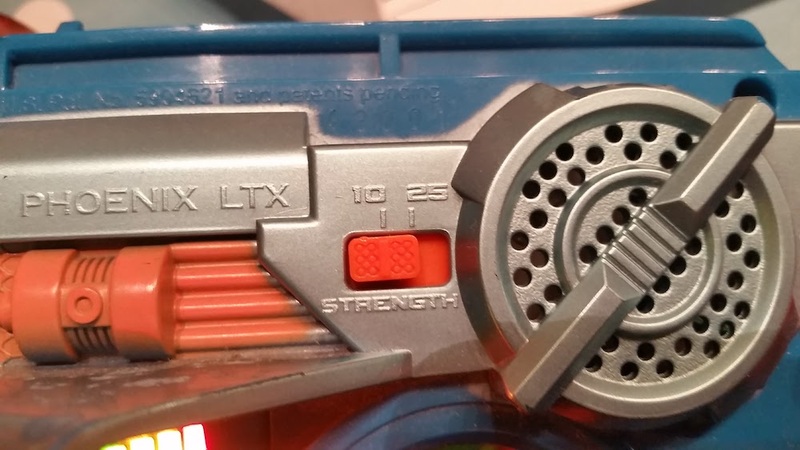 The second indicator is for the level of Ammo in your gun. Every time you fire your gun your lose ammo. The bars on the ammo indicator will drop when you start shooting. Once you are out of ammo, you wont be able to shoot until you reload. Which brings us to the next cool feature. 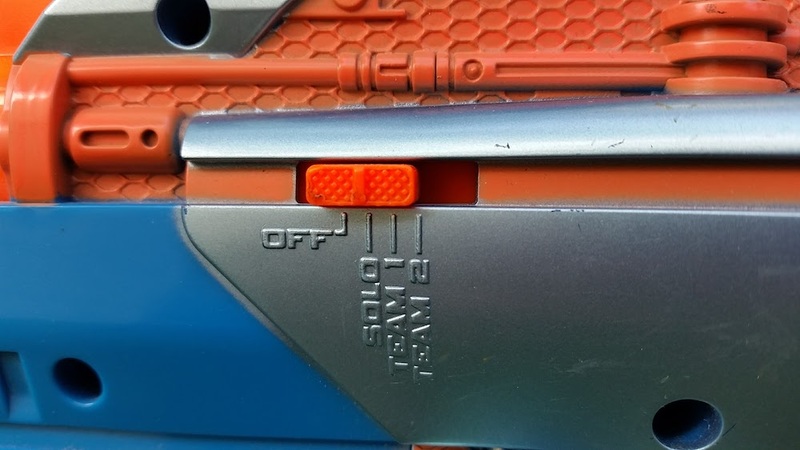 When you are out of ammo you will need to slide the orange lever near the back of the gun that will cause the magazine or cartridge to drop down from the grip of the gun. Then you will need to push the magazine back in to the gun to reload the ammo. This process takes very little time to do but adds so much to the reality of the game play. Definitely one of the coolest features in this toy. 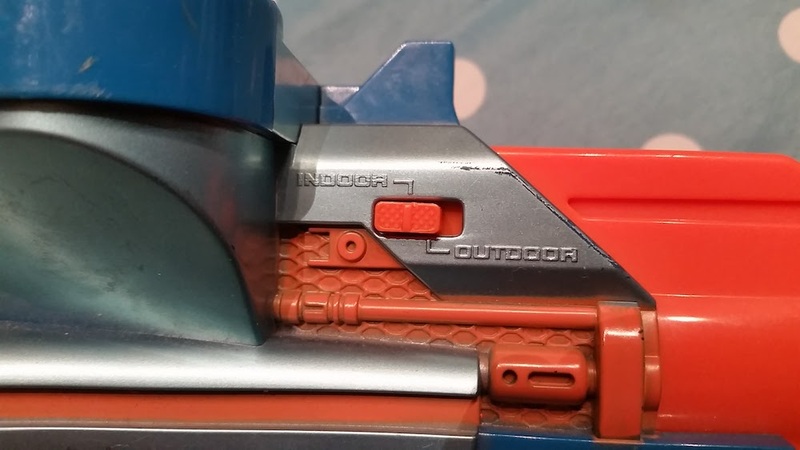 This feature is one of the coolest features on these guns and make them much better than other discontinued models. Every time your gun fires the hammer slides back ever so slightly and the gun lightly vibrates. This really adds to the whole shooting experience. 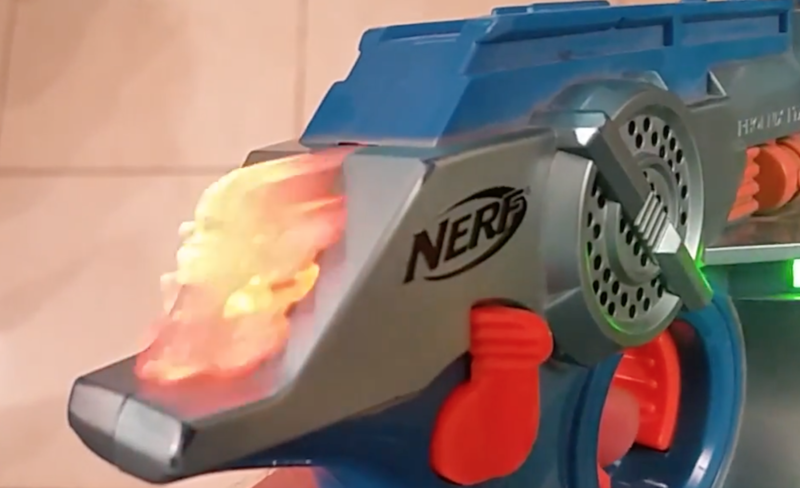 The gun also vibrates slightly when you get shot. Stay tuned for Part II of this article. 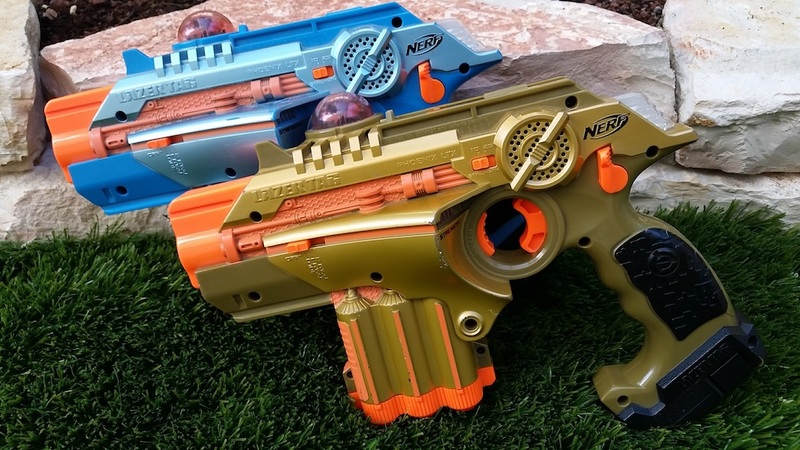 In the meantime, you could get these guns on either Amazon or Ebay. While the guns are definitely new on Amazon, you can really find some amazing deals on Ebay.